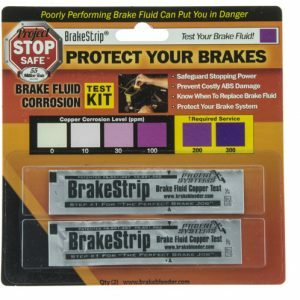 Most of the time, knowing when to change your brake fluid or coolant is a guessing game. With Brake Strip and Coolant Strip, in as little as sixty seconds you have clear, repeatable and reliable proof of the level of corrosion in your vehicles brake fluid and the acid plus freeze/boil point of your coolant. 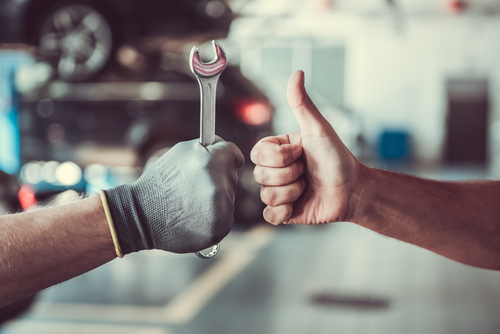 The test starts with removing your brake master cylinder cap and dipping the Brake Strip end of the test strip into the fluid, next you will remove your radiator cap and dip the coolant end of the test strip into the antifreeze. CAUTION: DO NOT remove the radiator cap when HOT! 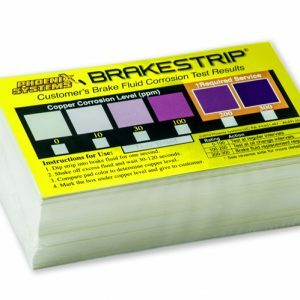 Once dipped in brake fluid, Brake Strip begins the corrosion measurement reaction – changing color from white to purple in direct proportion to the corrosion level. 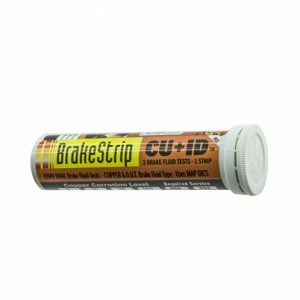 High levels of corrosion indicate brake fluid that has lost its ability to protect your brake system. 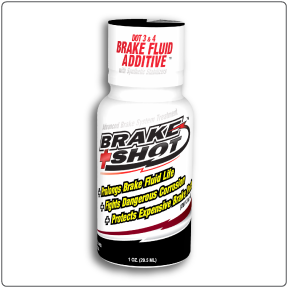 Corrosive brake fluid should be changed and a dose of “Brake Shot” should be added to protect against future corrosion Simply search for “Brake Shot” Once dipped in coolant, Coolant Strip begins the pH and glycol measurement reaction. The glycol pad can range from pink to red/blue depending on your glycol percentage. 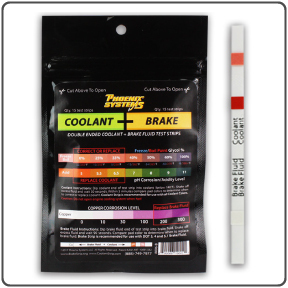 The pH pad can range from orange to yellow/green depending on the acid or alkaline level. 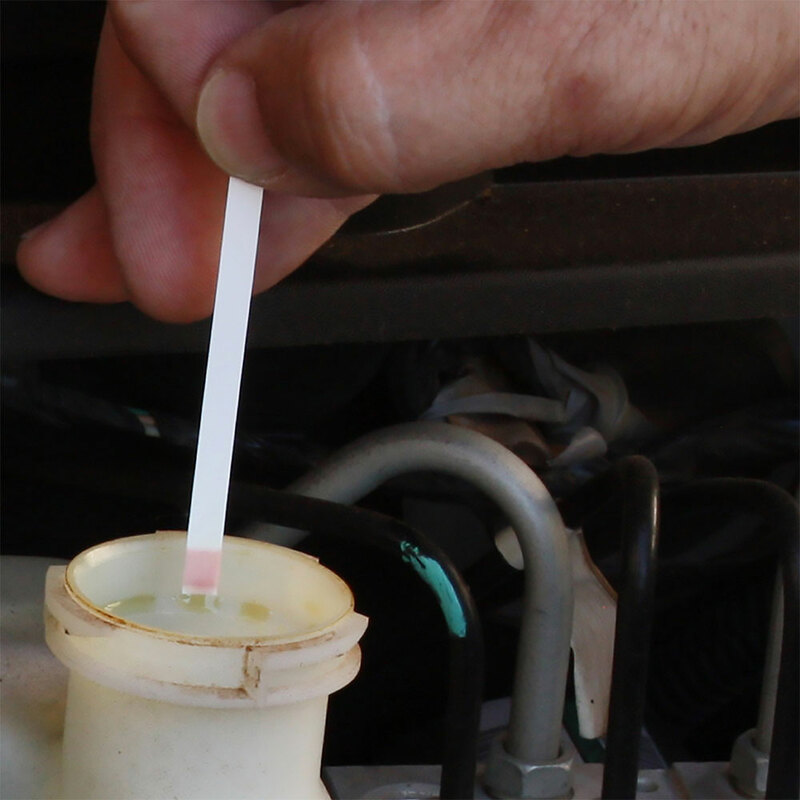 Low levels of glycol can quickly lead to a corroded water pump, heater core and radiator. Low glycol can also cause an engine to freeze in cold weather and create a crack through the engine block. 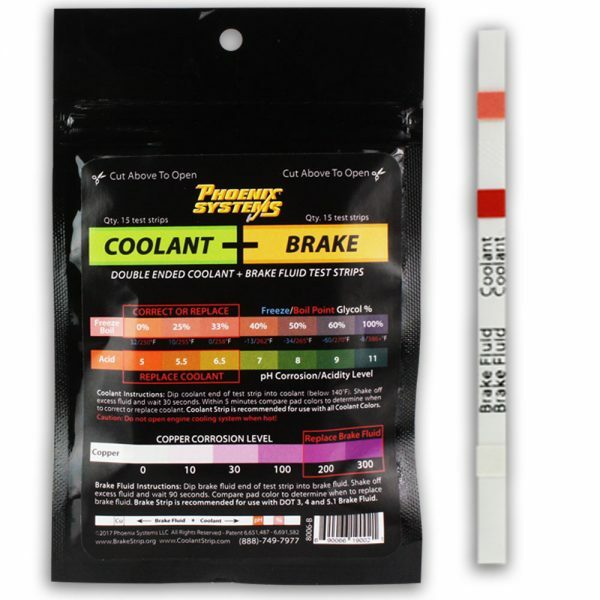 pH levels below 7 indicate acidic coolant. 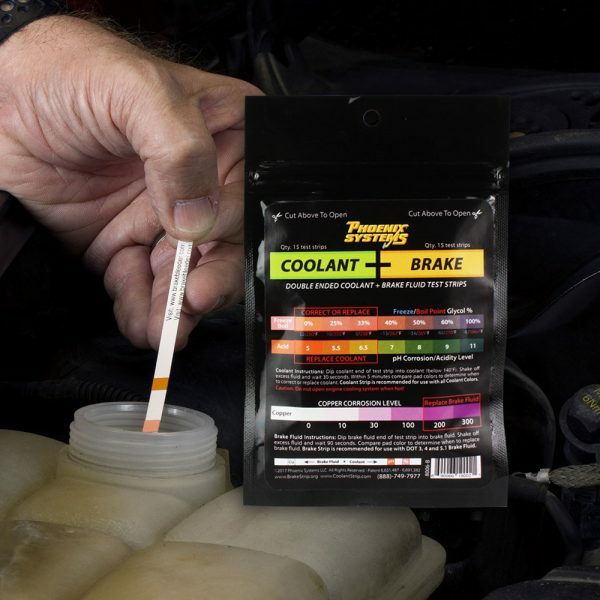 Acidic coolant will also quickly corrode a cooling system and lead to premature breakdowns and an unreliable vehicle. 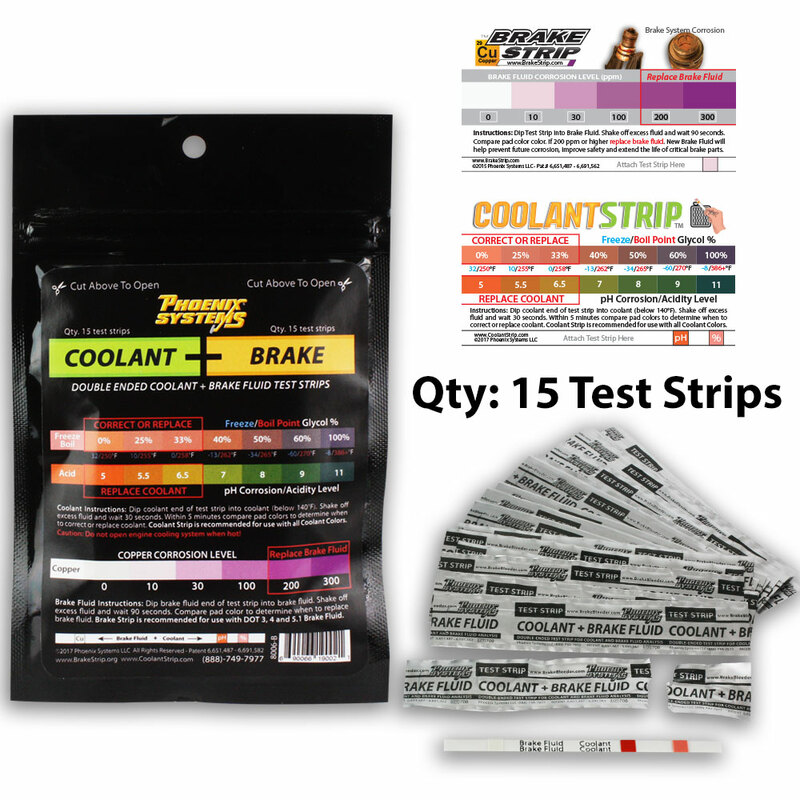 Coolant Brake Test Strips give you confidence to know the right time to change your fluids. Don’t let a shop pull the wool over your eyes! 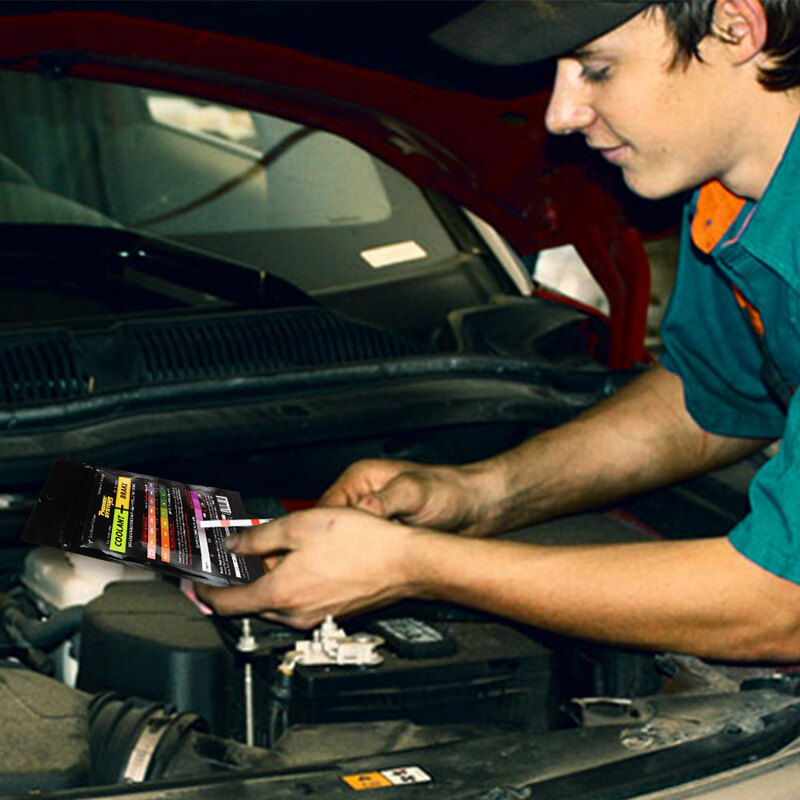 Find out for yourself if your fluids needs to be changed or not.